Nelson Provincial Museum is located in the heart of Nelson City on the corners of Trafalgar and Hardy Streets. Our museum rests on the same town acre block that the Museum occupied in 1842. The Lower Gallery exhibition leads visitors through an exploration of Te Tau Ihu, the top of the South Island from Tasman Bay to Golden Bay. This treasure-filled exhibition focuses on the region's fascinating history and identity, offering an opportunity for hours of discovery. The Upper Gallery is home to our short-term exhibitions, as well as our teaching classroom and a rooftop garden. 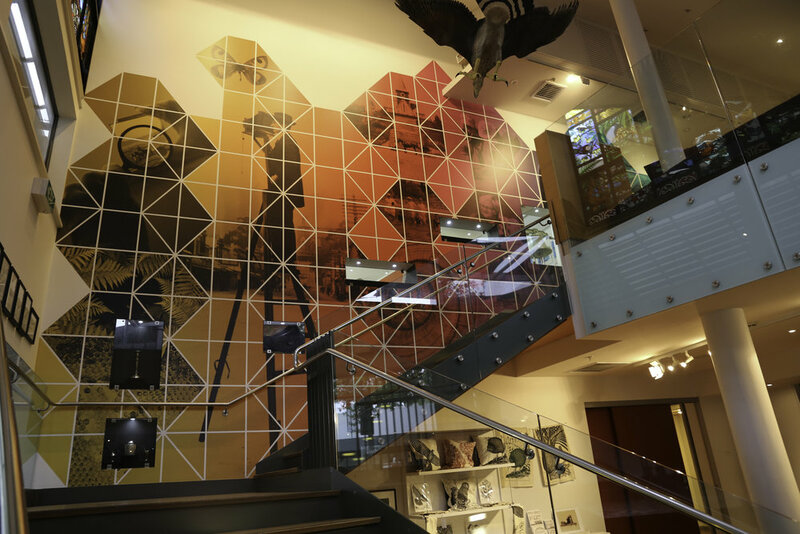 A vibrant stained-glass window featuring New Zealand's unique creatures and plants may be admired from the top floor. We recommend setting aside an hour or more to enjoy the galleries. Admission to the Regional Gallery is FREE for Nelson-Tasman residents. Fees may apply for temporary exhibitions. Wheelchair access: All exhibition spaces are accessible by wheelchair. Hire a wheelchair: We also have two wheelchairs for hire which can be pre-booked if required. Lifts: We have exhibitions and galleries on two levels which are accessible by a lift. Accessible toilets: There are accessible toilets located on both levels. Mobility parking: A mobility parking space is available on Hardy Street near the Museum Entrance. Assistance dogs: We welcome certified assistance dogs when assisting a person with a disability. Please ensure the dog wears the appropriate coat and carries a valid ID card. For visitors with hearing impairments: We are in the process of captioning the video’s we have on display. For visitors with vision impairments: We are in the process of creating specific tours for low vision and vision impaired visitors. Sweet As Café: Sweet As Café is connected to the Museum and is accessible via Trafalgar Street or through the Museum. Coat and bag Check-in: For the comfort and safety of visitors and collections, large bags, backpacks and tripods cannot be taken into the galleries. These can be left safely with Front of House Staff who will give you a numbered tag. Eating and Drinking: No food or drink is allowed to be taken into the galleries as eating or drinking in the galleries is not permitted. If you would like to organise a group visit or personalised tour, please contact us to discuss your requirements and to organise a time. In the case of an evacuation, our trained staff will follow procedures to assist visitors with impairments or special needs.